Commercial Solar PV and Thermal | A1 Sun, Inc.
From day one, an A1 Sun Solar System generates an income stream. As energy prices rise, your system and income stream become more valuable over time. Your system will pay for itself often within just a few years, after which your solar system produces steady escalating profit. With few moving parts, high quality components, and superior installation, operating and maintenance costs are minimal. 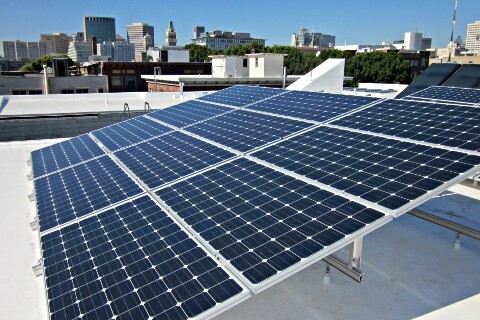 As an early adopter of green technology, installing an A1 Sun Solar System will reduce your operating costs and enhance your business profile in your community. A1 Sun offers a custom onsite evaluation and Free Solar Estimate for your business. Why Go with A1 Sun Commercial? We are cost competitive and always seek to find the best pricing from our distributors. Our low overhead and streamlined processes ensure your business will receive a high performance, reliable and dependable system of exceptional lasting value. Have a job that needs to be fast tracked? Call or email us and we will meet with you on site. Architects, contractors, and business owners work with us because we stay on time and on budget. We consistently meet or exceed schedules. We coordinate our field work with your timeline. We have excellent relationships with local jurisdictions and distributors. We know how to facilitate and expedite your A1 Sun solar project. We easily handle permitting, energy audits, PG&E forms, and expedite all other paperwork for you. If you or your client have any questions or would like more information on products or design, we will do	our utmost to answer as quickly as possible.